VOTING FOR THE ROUND OF 8 HAS ENDED. CLICK HERE TO VOTE ON THE NEXT ROUND. There are some tough matchups in these four games. * Will the Whohards and Fireflickians battle to the death to see which show is better? Or just stuff the ballot box? Star Trek: The Next Generation continued its blistering run through its region and beat my pick, The Twilight Zone, handily. 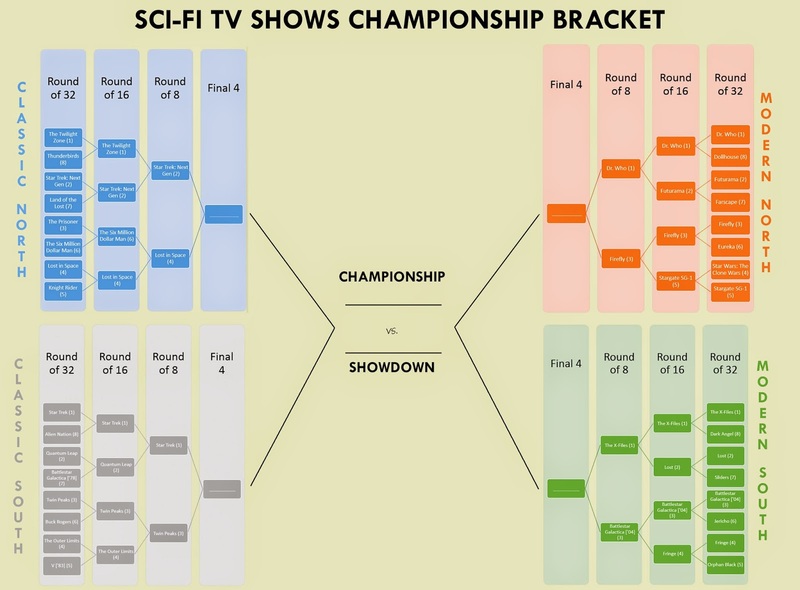 I was surprised how brutally The X-Files crushed Lost (by almost 60 percentage points), but can it steamroll fan-darling Battlestar Galactica? Our top vote-getter in this round was Star Trek, but can it be upset by Twin Peaks, the little-engine-that-could who people said didn't even belong in this bracket? All of these questions and more (or actually, just these questions) will be answered in a few days. So get voting! *Reddit users once again pointed out that I goofed the order of the initial round's games. I get it, I get it. But there's not "Ctrl-Z" in life, sadly.